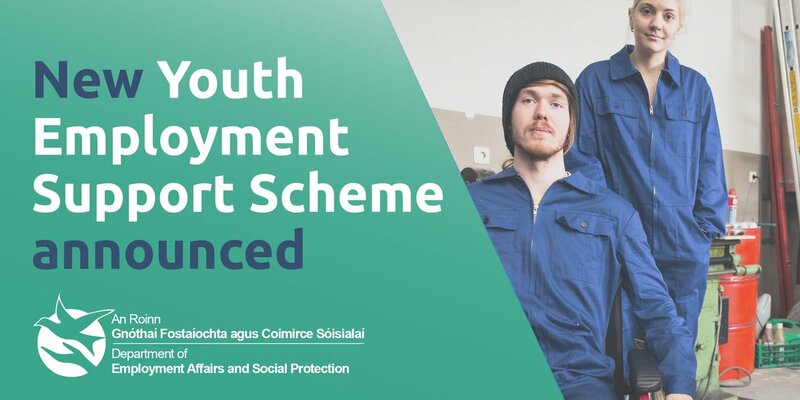 The Department of Social Protection has announced detail of a new employment incentive scheme called YESS (Youth Employment Support Scheme) which is coming into effect from 1st October 2018. The YESS is a programme specifically designed to provide workplace experience opportunities to young jobseekers while on a work placement. Participants on the YESS will be required to work 24 hours per week (over 3-4 days), and placements will be for 3 months initially, with an option to extend this further to 6 months. They will receive €229.20 per week with a possible increase of €22.50 if they were receiving a higher payment previous to commencement of scheme. The following are not eligible for YESS. Qualified Adult dependants cannot participate on the YESS nor can they use a spousal swap to become eligible. The only way for qualified adults to qualify is to be in receipt of an eligible payment in their own name. Jobseekers who are casually employed. Persons who are signing for credits only. Individuals, who are in receipt of a non-qualifying payment even if they are also receiving half rate Jobseekers Benefit, are considered ineligible for participation on the YESS. All YESS placements will be advertised on the Jobs Ireland website, www.jobsireland.ie and interested jobseekers will have to log onto same to view scheme vacancies. Employers must register on the website to advertise their available positions.